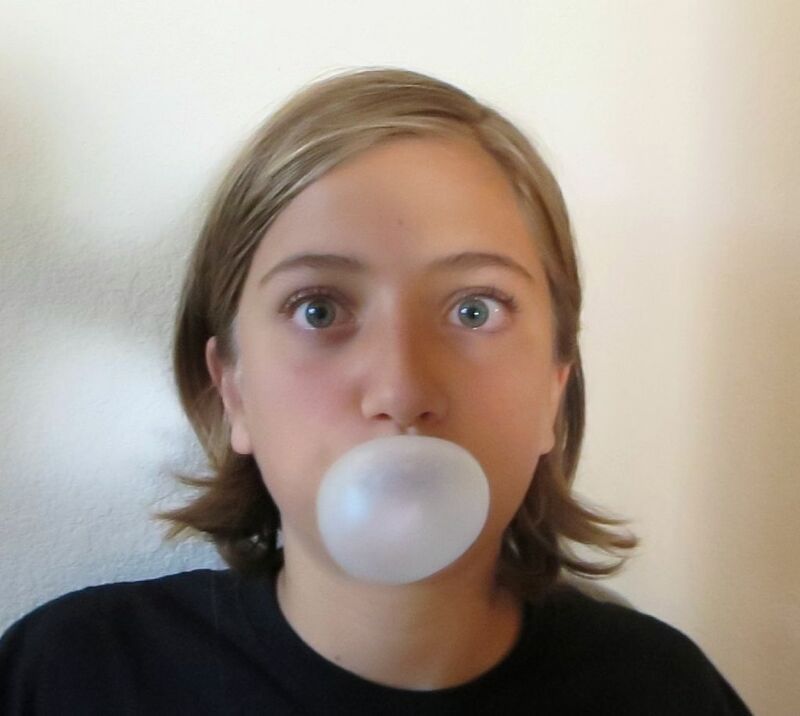 I recently learned that my eldest was stopping at a store on his way home from school, buying a pack of gum, and basically chewing the entire thing while doing homework before I even arrive home from work. I read the ingredients on the pack of gum, and I was appalled. I’ve spent this kid’s entire life feeding him all organic, vegan food, and not even buying him toothpaste that has toxic ingredients, only to find out that he will apparently put ANYTHING into his body without even batting one of his long lush gorgeous eyelashes (he definitely didn’t get those from me!). Soooo…I went online and looked for some all-natural gum. There are surprisingly quite a few that I would approve of, but there was one that stood out to me as being the most cute and fun one. It’s difficult to get someone to break a habit unless there’s an incentive, right? So, in this case, I discovered there are quite a few incentives! 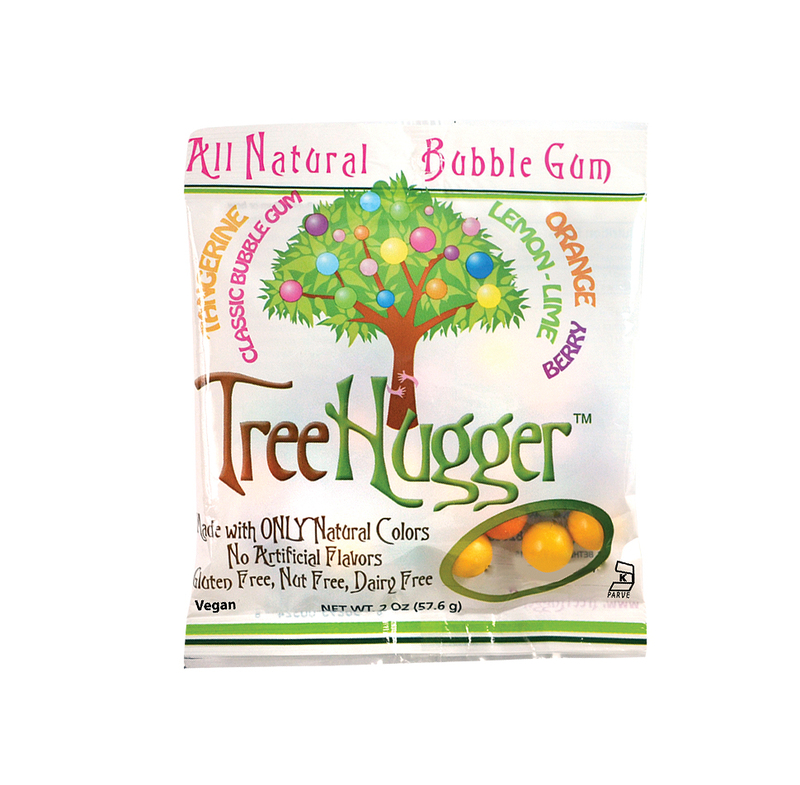 TreeHugger bubble gum comes in a lot of fun flavors: Pomegranate, Lemonade, Wildberry, Watermelon, and Tangerine, just to name a few. We did a few tests of the gum, and below are the results of these tests. 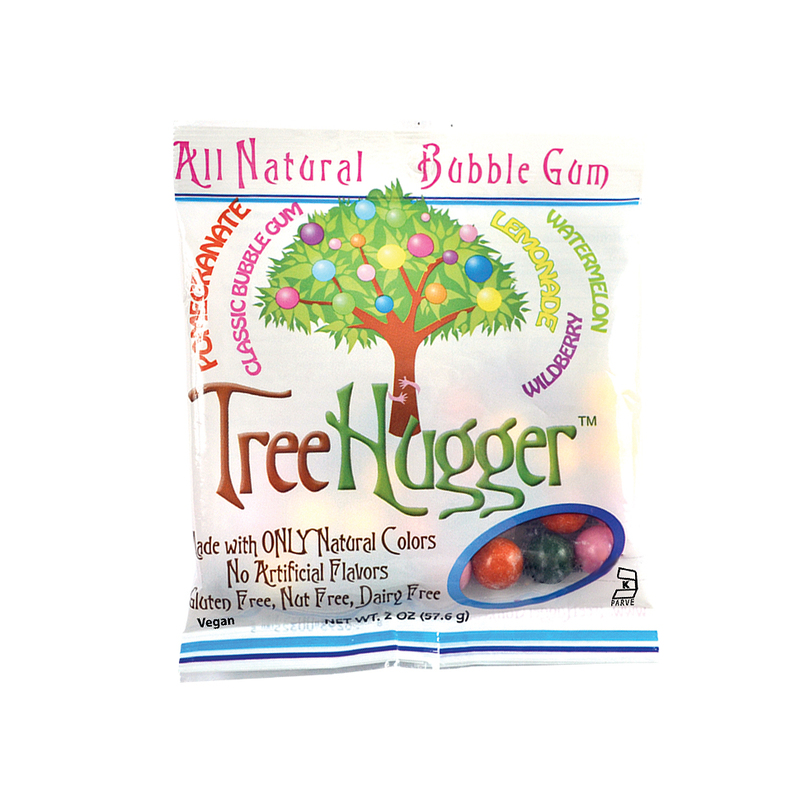 The eldest reports, “The complex flavor profile blends well to make a delectable gum.” What he seemed to like the most about the TreeHugger bubble gum is that the flavors weren’t simple. He feels like most bubble gum has very simple flavors and just a lot of sugar. I liked the flavors too. They start to wear off after about 10 minutes, but there’s still a slight hint of flavor that remains. 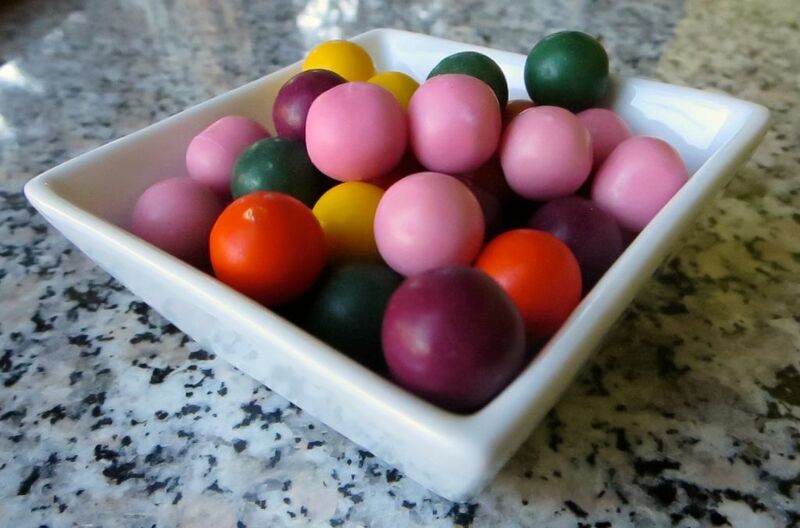 The gumballs come in the 2 sizes that we are accustom to gumballs being: small and large. We were able to blow small bubbles with around 3-4 of the small gumballs, but had to chew around 5-6 to get the large sized bubbles you see here. This is my favorite part! These are made with only natural colors, but they still look so pretty! There are no artificial flavors or ingredients that I can’t pronounce. It’s also gluten-free, which I’m sure is a plus for a lot of families (but doesn’t really apply to ours). 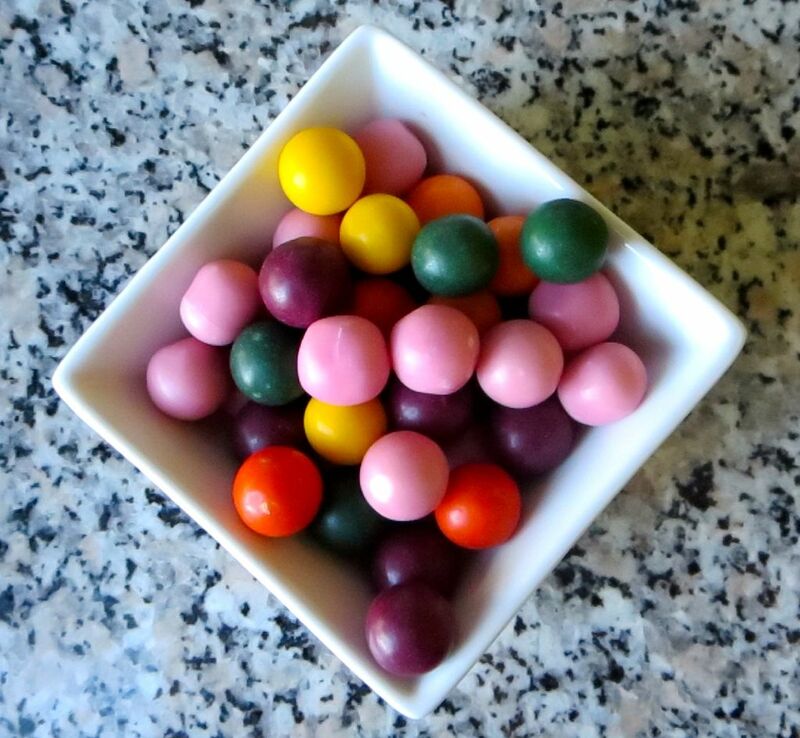 I hope one of the stores in SF sells the individually wrapped large gumballs so I can pass them out on Halloween. I’m soooo excited for Halloween!!! Visit TreeHugger online: they have a super cute website, and you can find out where to buy it.